Sarah Corvus:"Without being too melodramatic about the whole thing, I'm Sarah Corvus. 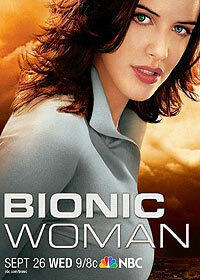 The first Bionic woman. Ta da." Little Girl:"Mummy, there's a lady out there running really fast, like as fast as a car!" Mother:"Sweetie, what did I tell you about making things up?" Little Girl:"I just thought it was cool that a girl could do that, that's all." Sarah Corvus:"The anthrocytes in our blood can filter out any impurities in our lungs. Fringe benefit of being a freak." Jaime Sommers:"What do you want from me?!" Sarah Corvus:"Honestly I'm not sure. Jogging partner?" Jonas Bledsoe:"You have 50 million dollars worth of my property inside you, so I guess you could say I'm your landlord." Jaime Sommers:"How I'm doing now?" Sarah Corvus:"Not bad. Not bad at all." Will Anthros:"You would've done the same thing." Jonas Bledsoe:"You never met my wife did you." Sarah Corvus:"Tell everyone Sarah Corvus says hello." Jonas Bledsoe:"Welcome to the game."